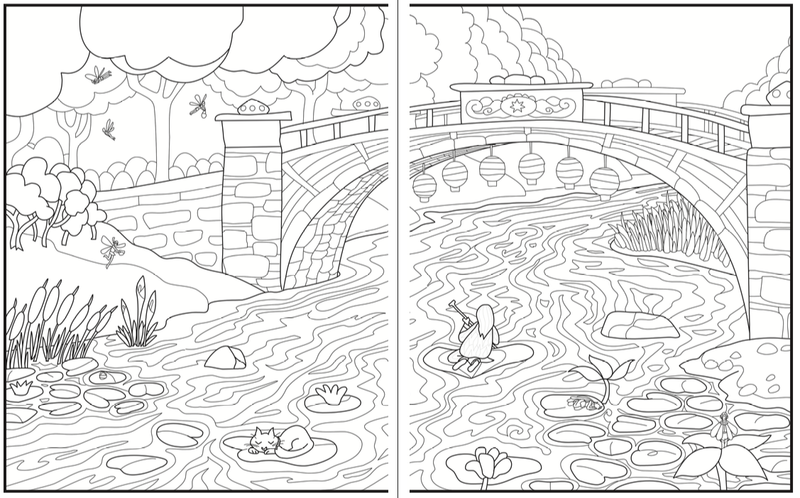 Introvert Dreams is a coloring book with a story to tell—a story that any introvert will understand. Join a quiet girl and her cat as they slip into the pages of a magical book and travel though her extraordinary dream world. She searches for a legendary seven-pointed star, said to be hidden away in a loud, crowded city. But can she ever find peace amidst the noise? Created by Jenn Granneman, the creator of Introvert, Dear, and introvert author Andre Sólo. What inspired you to make Introvert Dreams? Right away we knew we wanted to make something different. 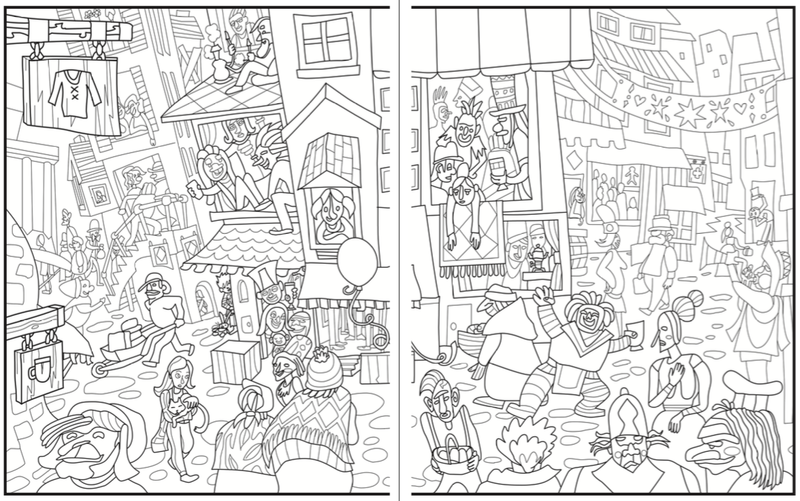 Most coloring books don’t have a real story running through them, but we think a story can add a lot. So we decided to follow an introvert and her cat through their own inner world. We brought on an amazing introvert artist, Maxeem Konrardy, who brought our crazy sketches to life. He created a whimsical, beautiful world of vast landscapes and forgotten places. As introverts, Andre and I both often feel misunderstood. We know that many introverts feel the same way, and we want you to be able to see yourself in this story. At one point our main character finds herself in the middle of a giant street party, and all she wants to do is cover her ears and sneak away. At another point she finds a beautiful lost shrine and decides to just stay a while where it’s quiet. Ultimately, we dedicated the book to the same wonderful people this website is dedicated to: all the quiet ones out there who have ever felt misunderstood. 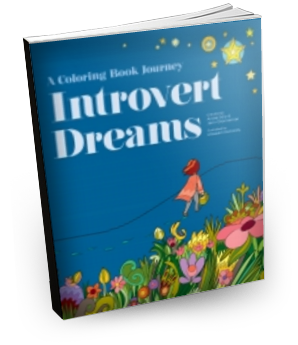 Whether you consider yourself an introvert or you just love coloring, we hope you’ll enjoy this book as much as we enjoyed making it. What are people saying about Introvert Dreams? “When I color in this book, I feel like my own mind is spilling onto the paper… this book helped me feel like I was CELEBRATING my introversion, honoring it, highlighting it, bringing it to life.” —Ellie J. “This is by far one of the best adult coloring books out there. The scenes are very creative and well-drawn. 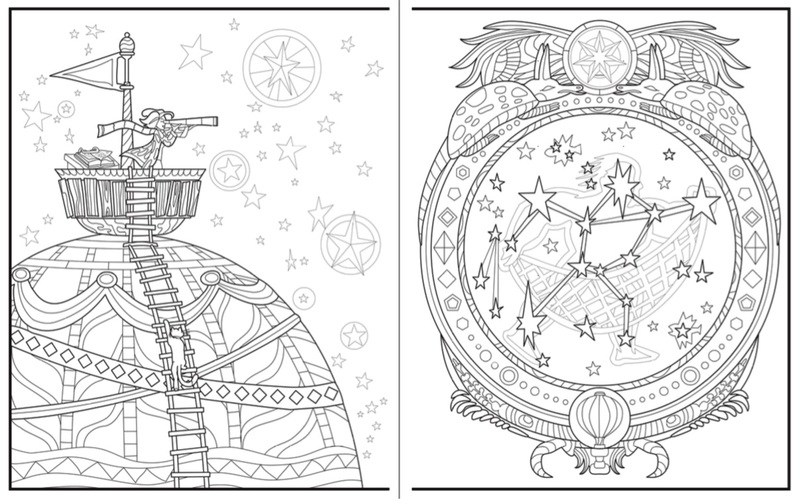 This coloring book tells a story and draws you into a different world, like when you read a good book.” —Brooke B. “It is full of breathtaking scenes that make you feel like you’re being drawn into a different world. The art is dreamy and captivating… I could spend hours getting lost in just one page of this book.” —Amber L.
Introvert Dreams is already available on Amazon.com in North America, the UK and Europe. It makes a great gift. Click here to get your copy. Click here to get your copy today. Or, help spread the word by sharing this page on Facebook or telling your friends and family.